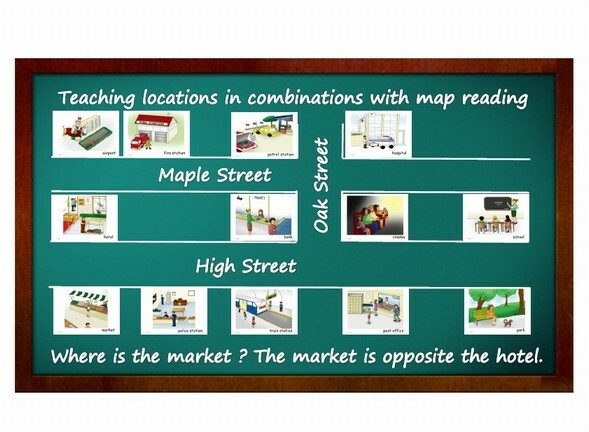 Introduce location vocabulary to students. Draw a simple map on the board. Stick locations onto the map and ask students questions. Where is the police station? The police station is next to the market. Where is the train station? The train station is between the police station and the post office. e.g.. NOTE: Location and occupation flashcards are matching, so you will find for every location a matching occupation card. Ask students: Where do teachers work? A teacher works at a school. e.g.. Matching Grid - Draw a matrix or grid on the board (at least 5x4 squares) and number your axis A to E on the top scale and 1to 4 beside the squares created; you end up with squares like A1, B2, C3 etc. Stick 10 location flashcards mixed up front to back onto the board and 10 occupation flashcards. Students have to find and remember the correct matching squares. Team who gets the most combination pairs wins (like memory game).